Jane Richardson brings extensive experience as a human resources leader and employment attorney to Tangram, where she inspires employees to align their talents and interests with the mission, values and strategic objectives of the organization. Jane discovered her passion for human resources while working as in-house employment counsel with a major energy company headquartered in Indianapolis. She transitioned from corporate law to human resource operations 20 years ago, and she has led the HR, compliance and corporate training operations at several dynamic organizations in the healthcare and technology industries. Jane is passionate about optimizing talent acquisition and retention, employee relations, employee engagement and culture, performance management and employee- and leadership development. Jane is dedicated to fostering a diverse and inclusive workforce where the dignity of work is celebrated. 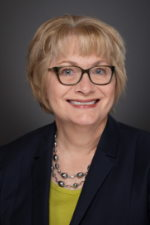 Jane received her Bachelor of Arts degree in Political Science from Indiana University, Bloomington, and her Doctor of Jurisprudence from the Robert H. McKinney School of Law, Indiana University, Indianapolis. Jane is admitted to practice before the Indiana Supreme Court and the U.S. District Court for the Southern District of Indiana.